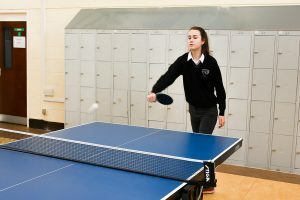 Table Tennis in Coláiste Pobail Acla is going from strength to strength in recent years. We have 2 top quality tables and all other necessary equipment. Students of all ages get involved during break times and our Table Tennis team also competes with other schools. In particular, we have formed a great link with Gaelcholáiste Chomáin and we get great enjoyment from our annual challenge matches against their team.